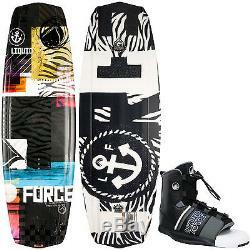 Liquid Force Witness Grind Wakeboard 136 + Element Bindings Mens. 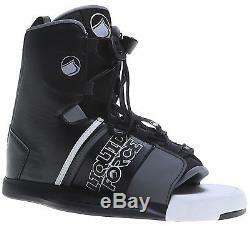 Liquid Force Witness Grind Wakeboard 136 + Element Bindings Mens Sz 8-12. The bindings in this package are available in one size, 8-12. The recommended weight range for a 136 cm wakeboard is 150-190lbs. The binding sizes are based on availability of the bindings. If you have ANY questions we'll respond quickly bringing you 15+ years of riding and instructing experience. Board - A fan favorite and people pleaser... The WITNESS GRIND has been a staple in the LF line for years! If you're anintermediate cable/rail rider or a boat rider looking for a poppy board with a durable Grind Base, the WITNESSGRIND will help you progress to the next level. 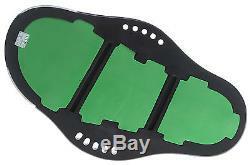 It has unlimited potential, is ultra smooth, and will improve yourriding. Many of the best have ridden this board at some point throughout their career because it flat out gets thejob done!! 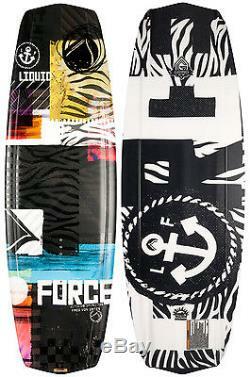 Key Features of the Liquid Force Witness Grind Wakeboard 136. Three Stage, Hybrid Rocker: Straighter center curve for solid edging and speed -Added kick at ends for steeper arc off wake. Double Concave V-Tail: Controlled water flow through the ends for extra thrust and lift - Quick rail to rail transitions. Winged Rail Shape: Side slots give extra bite for back footed riding and quicker release off the wake. LF Exclusive Grind Base: Durable sintered base that holds up to daily park abuse. Molded in Deep, Canted Long Based Side Fins: Large inside fin face gives super positive hold while its low profile allows for no hang-ups. Binding - Key Features of the Liquid Force Element Wakeboard Bindings. N66 Chassis: Injection molded Nylon 6 plastic, 6 inch spread with 12% glass reinforcement chassis that is base in which the binding upper is built. EZ Glide Lace System: New Design for 2013! Specially designed injection molded parts that allow the laces to move unrestricted when tightening and loosening the binding lace zones. Stretch Zone (Back): Integrated Stretch Zone panel designed into the back of our bindings flexes and allows for ease in and out of the binding. Flex Zone: Lateral and Medial molded parts of selected bindings that allow the binding to flex in all directions freely without restriction from materials and hardware. Cuff Stretch Zone: A stretch zone that connects the upper cuff and lower throat area on selected bindings. This allows the binding to move forward and backwards, as well as side to side without restriction. We reserve the right to use either company. We take customer service very seriously. Our priority is to offer the best shopping experience possible. All emails are replied to in less than 24 hrs. 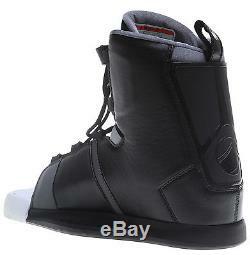 The item "Liquid Force Witness Grind Wakeboard 136 + Element Bindings Mens Sz 8-12" is in sale since Friday, November 11, 2016.